Example These are <em>not</em> the droids you are looking for. html_strip Char Filter These are not the droids you are looking for. Another Example Obi-Wan never told you what happened to your father. Another Example <b>No</b>. I am your father. SELECT * FROM starwars WHERE quote LIKE "?an" OR quote LIKE "V?n" OR quote LIKE "Va?" 1.2499592 == 43% or 100%? PS: Shards Default? Effect on IDF? Whitespace Tokenizer "weight( Synonym(quote.ngram:biw quote.ngram:iwa quote.ngram:obi quote.ngram:wan) in 0) [PerFieldSimilarity], result of:"
Today’s applications are expected to provide powerful full-text search. But how does that work in general and how do I implement it on my site or in my application? How full-text search works in general and what the differences to databases are. How the score or quality of a search result is calculated. 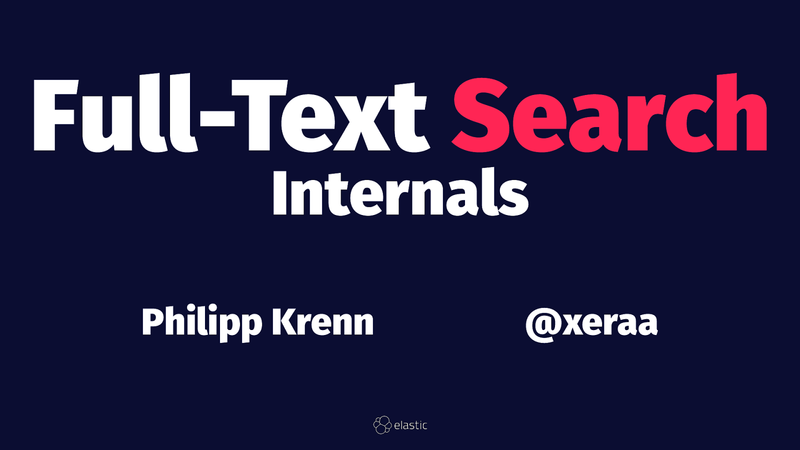 How to handle languages, search for terms and phrases, run boolean queries, add suggestions, work with ngrams, and more with Elasticsearch. Trying out various search features in Elasticsearch.